$295/n APRIL 13-19 DUE TO LAST-MINUTE CXL!! UNIQUE UPGRADED VILLA! 2 Suites / 2 Bathrooms / Sleeps 6 Totally equipped for children! More than $10K in upgrades! New Housekeeping company and Resort-based Maintenance for prompt attention to your needs. Relax...Escape from the hustle and bustle of the city and other crowded hotels. World class Ko Olina resort seems like a world apart, yet you can enjoy the convenience of having everything within a few steps, or a short drive. * One-of-a-kind, hand-carved accents and furniture from local importers. * Fresh paint job, with brand new lighting and ceiling fans for a welcoming ambience. * New top of the line wall-mounted flat screen smart HDTV's: 55" in living room, 50" in Master Suite. The second Suite also has a 42" wall-mounted flat screen HDTV. * High-quality linens and Tommy Bahama pillows. Just steps from the pristine waters of the semi--private beach (Lagoon 2). OCEAN/POOL views from lanais and suites!! Wake up to a resort atmosphere and enjoy breathtaking sunsets, while relaxing to the sound of the landscaped waterfalls. * Expansive lanais off Living Room and Master Suite with pocket doors create an airy and seamless transition between indoor and outdoor living. * Finished with exotic woods and natural stones by renowned designers Philpotts & Associates. * Custom kitchen by Hawaii’s foremost chef Roy Yamaguchi, with the finest Sub Zero & Wolf appliances, wine cellar and open design ideal for entertaining. * Baby items included at no extra charge! Our family invested in this property while we were blessed with the opportunity to live in Hawaii. We were one of the first owners to purchase and we have shared our piece of paradise with many families for the past 10 years. We wish to keep doing it for many years to come and then pass it along to our children as part of their heirloom. We fell in love with the place and we are sure you will too! We personally own and manage this property which ensures you can have direct access either by email, phone, text message (preferred). We have more flexibility to work with your needs. We have also contracted with a dedicated housekeeping company with great attention to details, and signed up for a monthly maintenance program provided by resort staff on-site. They also respond to maintenance calls from guests. This ensures everything is well-kept and updated, and that any unexpected issues that may arise can be taken care of in a prompt manner. We personally invested our time and resources upgrading and remodeling this villa with a distinctive Indonesian atmosphere. The direction the condo faces helps keep it cool and pleasant under the hot Hawaiian weather, unlike other units. Please note that the villas that are not overlooking the pool/interior gardens are either facing the empty lot of land and the Marriott timeshares to the left of the building, or the parking area and empty lot on the right side. The views from this villa are always protected: you will enjoy a wonderful resort atmosphere with pool views from all bedrooms and lanais, as well as Koi ponds and partial Ocean views. Dining set for 6 people, counter stools for 3 people and lanai dining set for 4 people. 55" Flat screen smart HDTV with blu ray in Living. 50" Flat screen smart HDTV in Master Suite. 42" Flat screen HDTV in Second Suite with DVD player. Available for rent from the resort. Perfect two bedroom condo in Ko Olina. Faces pool and north - so no direct sun to heat up the unit and a great view of this awesome complex. Ocean view is a bit obscured and distant - but interior of complex is a great view in and of itself. Condo is well appointed and very comfortable. Great pools, Koi ponds, workout facility and right on a gorgeous lagoon/beach/ocean vista. Highly recommend - we hope to come back in the future! We loved staying at the property! Place was clean, grounds are beautiful and there were places within walking distance to eat and activities to do! Great location, fantastic apartment - hope to come back some time. The apartment is very well appointed and in a great location. We used the snorkels and flippers that are included. No problems with the place at all and we would certainly come back in the future. great apartment , great location. 4 stars only because twin mattresses are in very bad condition. It was a beautiful place to have my family. 81 your old mother enjoy being able just sit out on the patio and enjoy the scenery. The accommodations very clean, the staff the Beach Villas very helpful and nice. We are looking forward to hopefully coming back next year, and hoping to rent the same Villa. Thank you again. Suzanne and family. The property is beautiful,a great place to stay. Thanks for your kind words and for letting us know about the carpets, it has been taken care of. We are happy that you enjoyed your vacation and hope to have you back soon! 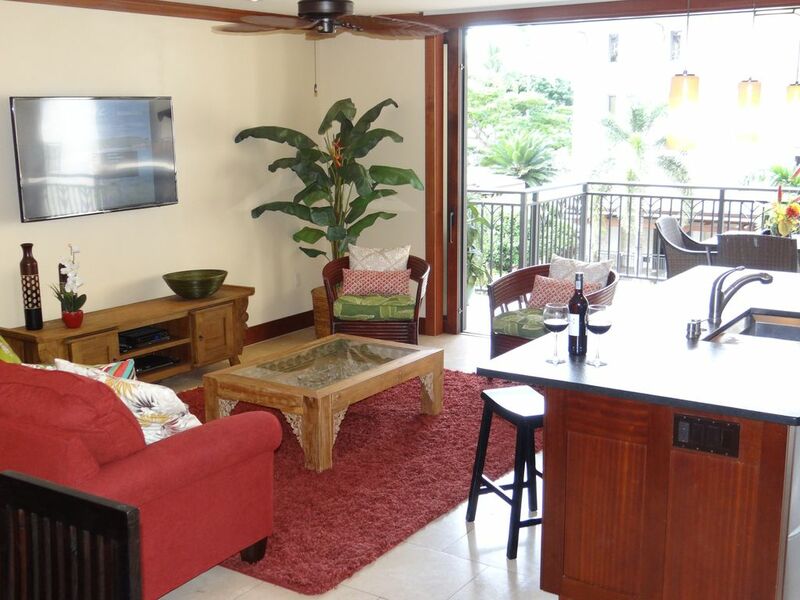 This Ko Olina Beach Villa is located within the Ko Olina Resort & Marina. Experience a wealth of world-class amenities: four tropical lagoons/secluded sandy beaches, water activities, world-class restaurants, shopping and nightlife, 330-slip Marina, wedding chapel, tennis and lavish spa treatments, a round of golf at the renowned 18-hole Ted Robinson Championship Golf Course (across the street), authentic Hawaiian luau at Paradise Cove (Lagoon One), bike rentals, extended running/cycling trails along all four lagoons, sunset dinner cruises, catamaran trips known for dolphin sightings. Enjoy the exciting Waikiki and Honolulu city life approximately 20 miles east. Kapolei downtown is 2 miles away, with movie theaters, restaurants, Costco, Target, Kmart, specialty shops, etc. We accept (with no charge) personal checks, cashier's checks, money orders and traveler's checks. Credit cards accepted through Paypal with a 2.9% fee (domestic), 3.9% (Canada); please contact us for other locations. The Homeaway website also offers the convenience of paying through their site with a 2.9% fee for Visa, MasterCard, and Discover cards issued in the US, and 4.9% for cards issued outside of the US. Please refer to rental agreement for details. Rates are subject to change until reservation is confirmed. Must be 21 years or older to make reservations. No refunds for early check outs. No smoking/no pets. Price Match! Ask about military, kama'aina and last-minute discounts! (may not apply with current promotions). Additional discount for more than 2 consecutive weeks. Monthly rates available. A deposit of 30% of the total (base rate+tax+cleaning fee) is required to confirm and hold the reservation. A payment equal to 35% of total is required sixty (60) days before arrival. The final balance (35% of total) is due thirty (30) days before your arrival date.